While the guys worked outside (thanks for the help Mitch!) putting away all the patio furniture and breaking down the gazebo for the season I was in the house straightening up and making some soup. I've been making lentil soup for about 20 years now. I know it's one of those soups that not everyone likes. My kids don't like it, but luckily my husband does. I have made dozens of different version of this soup. It always has onions and carrots in it, but sometimes I will add some chopped up kielbasa, or some diced up turnip, or escarole. I bought a huge bunch of escarole this week so that's what went in it this time. 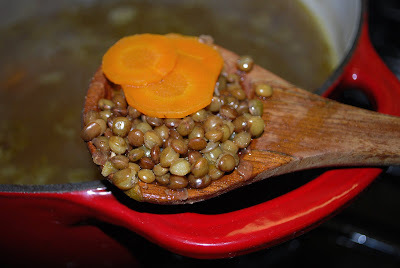 I used the little French lentils which really hold their shape in the soup. After a busy day outside the guys were happy to come in for a big bowl (or two) for lunch. I'm saving mine for dinner. 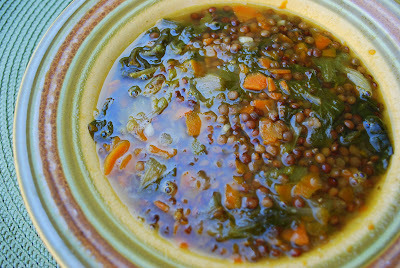 I start my lentil soup like I do most of my soups, with olive oil and onions. In a big pot put a few good tablespoons of olive oil and add the onions. Cook the onions until they are translucent. At the last few minutes add the garlic. Transfer this to a big cooking pot. Add in the chicken broth, sliced carrots, and the lentils. Season generously with some Mrs. Dash. Cover and let come to a boil. Remove cover and turn down heat so you have a really low boil. It will take between 45 minutes to an hour to cook the lentils. Just take a taste every once in awhile to check. Once the lentils are cooked add the escarole. Now escarole is a lot like spinach. It will look like you have way to much of it, but once you cook it it will shrink down to nothing, so go ahead and put lots of it in. Cook for another 15 minutes until the escarole is tender. Mmmmm. Lentil soup sounds good. I add a sweet potato and a beer for part of the liquid.